Nicole's Needlework: Quaker Faith Hope Love Finished! I got this finished up last night. This was just what I need a smallish project that I could finish fairly quick. Midnight Stitching "Quaker Faith Hope Love"
I love your Faith Hope Love Quaker Nicole, it's gorgeous! You have accomplished so much here! Your faith, hope, love is really pretty and seemed to finish up quickly! Your stitching is always so beautiful! Congratulations on the finish, Nicole - it's beautiful! You're making great progress on Little House Neighbourhood - at the speed you stitch, I see another finish in your future! Beautiful finish, great WIP...keep up the great stitching, I enjoy visiting your blog. Congratulations, they are both gorgeous! both are beautiful Nicole!!!! You are such a pretty stitcher!!! I love it, it's gorgeous!!! Faith Hope Love is gorgeous Nicole. Congratulations on your finish. How pretty that Quaker is! And your Little House is lovely too. Send some of that rain up here, we could use it. Lovely finish, and your neighborhood is coming along beautifully! How on earth do you get these done so fast? FHL looks marvelous!! Faith Hope and Love is really beautiful Nicole - well done! Love your finish and your WIP is looking great! Wonderful finish and your LH WIP is looking fab! Your finish is lovely! Congratulations! I just love your neighborhood and can't wait to start mine! I have my threads and fabric. Just waiting on the pattern. I have studied it to see what I want to change and am ready to stitch! Great finish, Nicole! Your Neighborhood's looking terrific too!! I nominated you for an award. Please visit my blog to pick it up. Hi Nicole, Congrat's to you on a fabulous finish. Faith, Hope and Love is truely beautiful. I have so enjoyed watching your progress on The Neighborhood, you are doing such an amazing job on this gorgeous piece. I have 2 Awards awaiting you. Please, when you have a moment, won't you check out the details on my Blog. This turned out great! I also awarded you with a blog award. If you go and check out my blog you'll see all the details. All your pieces are always so wonderful, Nicole. Great finish; love the design! Love the Quaker Faith Hope Love! Turned out beautiful. You should email me the pic to put in my gallery. Your's would be the first one of my new release! 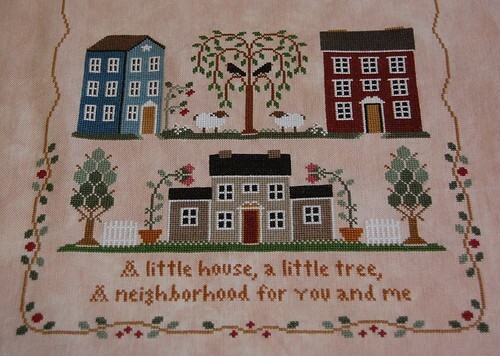 Love your neighborhood stitching! !